ordinary people, scientists, politicians, bloggers, activists… so many voices, that in this deafening noise no one hears the message anymore. So this year, NOE ASSOCIATION decided to turn to the one voice the world couldn’t ignore : the one of Nature. To deliver her message, Koko was interviewed by Penny Paterson, Director of Research at the Gorilla Foundation, and the result has been edited to a short video. Finally, nov. 30th 2015, at the opening of the COP summit, Koko addressed her message to the world. and millions of visits on the dedicated website. 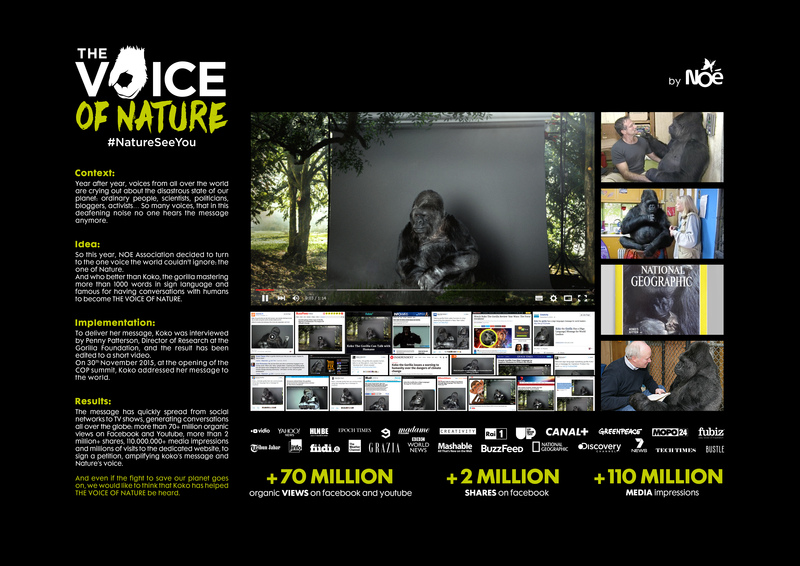 And even if the fight to save our planet goes on, we would like to think that Koko has helped THE VOICE OF NATURE be heard.